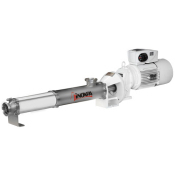 INOXPA is a progressive cavity pump manufacturer. 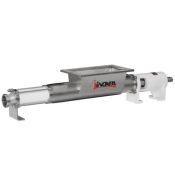 Progressive cavity pumps are used to transfer products of low and high viscosity as well as products containing soft particles. 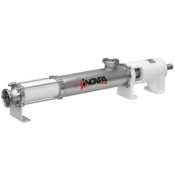 Thanks to the hopper and auger, the KSFT progressive cavity pumps are suitable for pumping high viscosity products, doughs, pastes and liquids with suspended particles. KSFT type is a sanitary progressive cavity pump. Close-coupled construction with direct coupling to the drive. Single flushed mechanical seal (Quench). Stators: white EPDM and black NBR. Summary La bomba KSFT es una bomba de tornillo helicoidal sanitaria. 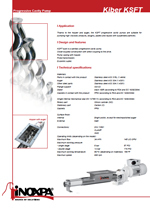 Summary KSFT type is a sanitary progressive cavity pump. Summary Le KSFT est une pompe à vis hélicoïdale sanitaire. Summary Le pompe KSFT sono pompe a rotore elicoidale sanitarie. Summary Насос KSFT - это винтовой насос санитарного исполнения. Summary Este manual contiene información sobre la recepción, instalación, operación, montaje, desmontaje y mantenimiento para las bombas KIBER KSF / KSFT. Summary This manual contains information about the reception, installation, operation, assembly, disassembly and maintenance of the KIBER KSF / KSFT pumps. Summary Les pompes hélicoïdales kiber KSF/KSFT d'INOXPA, compactes et robustes, font partie de notre gamme de pompes à rotor hélicoïdal à déplacement positif qui convient particulièrement aux liquides visqueux.